Although first and foremost a festival of music and poetry, the National Eisteddfod of Wales has a strong reputation for promoting the best in contemporary Welsh art. This year’s event, currently being held in Cardiff’s Pontcanna Fields, is no exception. The Art Pavilion contains a broad mixture of painting, photography, ceramics and film. Although there is no overall theme, many of the featured artists deal with issues of global importance, such as the ‘War on Terror’. David Garner’s Amplified Intolerance incorporates the Adhan or Islamic call-to-prayer playing from a loudhailer, on which is etched the controversial remarks of novelist Martin Amis calling for “The Muslim community… to suffer until it gets its house in order”. Elsewhere, Hannah Downing and Daniel Crawshaw draw on media images of war in their photo-realist paintings, as does Peter Finnemore, whose banners of screaming faces hang like window blinds from the gallery walls. Within this context, David Hastie’s prize-winning installation, Two Tables, takes on new meaning. Originally a comment on religious conflict in Ireland, the work featuring two castles mounted on diverging tables could be reinterpreted in terms of the current cultural tensions between East and West. Whether by accident or design, these buildings have become knitted together by spiders’ web, adding a further layer of meaning about the role of communication networks in uniting communities. 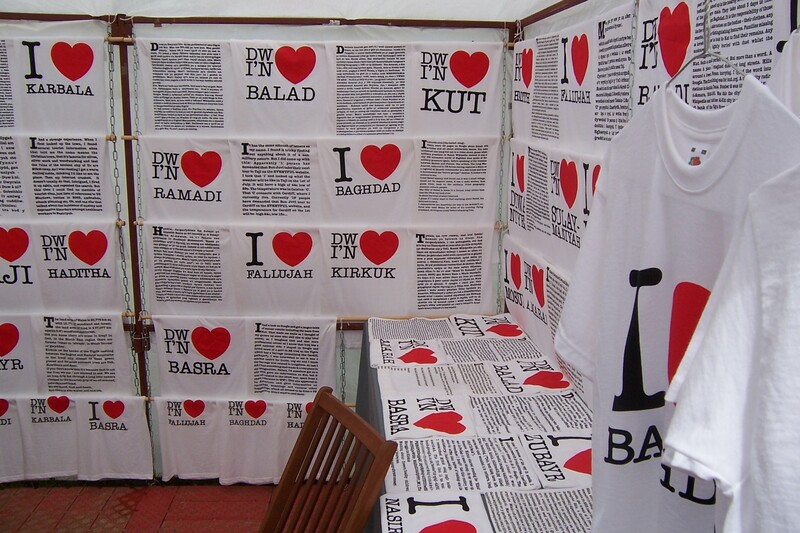 Outside the Art Pavilion, Iraq-born artist Rabab Ghazoul has setup a market stall selling T-shirts based on the iconic ‘I Heart NY’ design, except that the letters ‘NY’ have been replaced with the names of Iraqi towns, such as Baghdad, Fallujah and Basra – places of great cultural and historical importance, but better known these days because of the Iraq War. Other notable contributions include work by the TRACE Collective, who have erected a scale replica of their Cardiff headquarters, in which they will stage performances throughout the week. Somewhat more captivating, though, is the special exhibition dedicated to veteran artist Charles Bryd. His playful kinetic sculptures and whirligigs, which first appeared at the 1970 Ammanford Eisteddfod, illustrate how much the Welsh art scene has changed over the past four decades. Until Aug 9, National Eisteddfod of Wales, Pontcanna Fields, Cardiff, Mon to Sat 9am-6pm, £12 adults, £8 concession. This post was originally published in The Metro. This entry was posted on August 1, 2008 by Huw David Jones and tagged Byrd, Charles, Daniel Crawshaw, David Garner, David Hastie, Hannah Downing, Rabab Ghazoul, TRACE.